The ability of the data logger to measure small changes in voltage provided valuable information in optimising the usage of the motor. 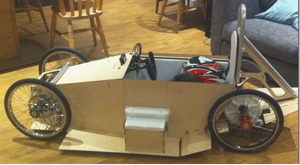 The Greenpower Education Trust promotes sustainable engineering to young people, organising a series of nationwide racing challenges for electric cars. It encourages children, mainly through schools, to become inspired in science, technology and engineering, offering a chance to work together as a team to design and build an electric car and then test it in competition. The racing series is based around a standard electric motor and batteries with the challenge being to build the most efficient car which will travel the furthest in 90 minutes on a single set of batteries. Hugh Watson is Technical Director of Innova, a precision engineering company based only a few miles away from Gemini Data Loggers' Chichester headquarters. Hugh and his two sons have designed and built a car themselves, and ran it for the first time at an event at the Goodwood Motor Circuit where they finished 19th out of 70, winning the best newcomer award. The next step was to make the car more aerodynamically efficient with a body shell and to ensure that the motor was running in the most efficient manner. Paramount to achieving the best result is accurate current monitoring, so Hugh aimed to measure the voltage drop along one of the power cables and calculate the current draw from that. Tinytag data loggers were recommended by a friend, and Gemini supplied a voltage data logger which monitors 0 to 2.5V DC. The logger was used to monitor the voltage drop on the input cables in order to calculate the current. Analysis of the data allowed comparisons of the current drain, resulting in changes to the car's gearing in order to maximise the speed. The next challenge was held at Dunsfold Park - otherwise know as the venue of the Top Gear test track - where the car came in 10th out of 50. Hugh has been impressed by the quality of the data provided by logger, commenting, "It has recorded tiny drops in voltage very accurately, allowing us to make informed decisions about optimising the usage of the motor." Gemini designed the TK-4703 voltage data logger as an economical solution for applications such as this where small changes in voltage need to be accurately recorded. Its compact and lightweight design also makes it ideal for use where space is at a premium.